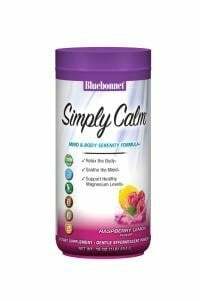 Bluebonnet's Simply Calm Raspberry Lemon Flavor Powder is a special, water-soluble blend of magnesium carbonate/citrate for occasional sleeplessness, stress, as well as bone and immune support. Bluebonnet's Simply Calm Raspberry Lemon Flavor Powder is a special, water-soluble blend of magnesium carbonate/citrate for occasional sleeplessness, stress, as well as bone and immune support. Magnesium is an essential mineral required in over 300 biochemical reactions in the body and known for its ability to help the mind and body ease into a state of calm...simply.